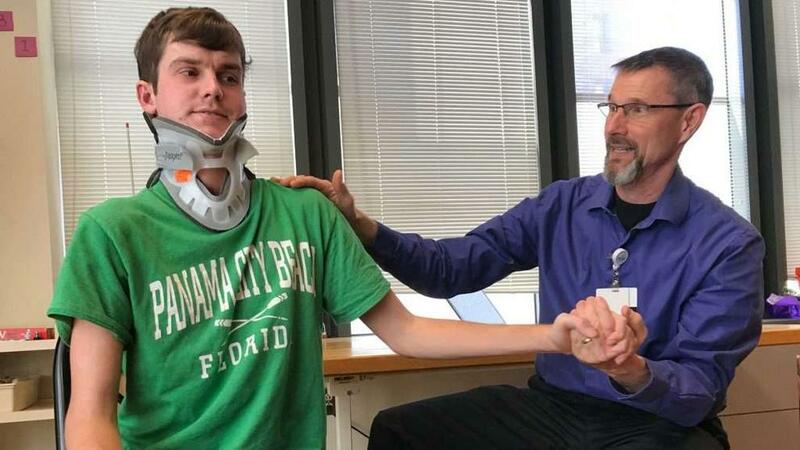 An Indiana man has miraculously survived two brutal head injuries in a row. Brock Meister of Plymouth, Indiana beat brain cancer only to be in a violent car crash that left him internally decapitated. What does that mean? Well, it basically means your skull is entirely unattached from your spine and is only held together by the skin, muscle, and other tissue around the neck. "I have fought for my life this time around, and some days I feel like I still am. God has put me through some crazy stuff, and he’s really testing me," Meister said. "I'm just thankful to be here, so that’s all that matters," the 22-year-old said. The near-death accident occurred on January 12 when Meister was heading to Lake of the Woods near Bremen. Meister and some friends were planning on staying the night with his grandparents. But minutes before arriving, their truck hit a patch of black ice which sent the vehicle into a wild roll landing on the passenger side where Meister was sitting. His head violently smashed into the window and shattered it. In the impact, Meister's head was literally separated from his spine. "Half my body was out the window," he explained. The driver pulled Meister back in as the truck flipped upright and slowly came to a stop. His other friend Ryan Topper in the car ahead of them knew something was wrong when the truck's headlights behind him disappeared. "I turned around and from the angle that I drove up on it, it didn’t look like anything had happened at all," Topper said. As Topper got closer to the scene of the accident he described seeing Meister's face covered in blood. "He wasn't saying much," Topper said. He called emergency services and got them on the way to the scene. "Brock kept trying to get up and the only words he was saying were ‘my neck’ and ‘ambulance.’ I knew that he was in some serious pain and that if it was his neck, I couldn’t let him get up and move," Topper continued. Meister was taken to Memorial Hospital in South Bend where doctors who took X-rays said that he had suffered what is called "traumatic atlanto-occipital dislocation," which is essentially a "complete separation of the skull from the spine or internal decapitation." Surviving this type of injury is very rare. It took multiple surgeries to re-align his skull and spine and they were screwed into place.